A Feature Documentary about William McNamara, who was the secretary of defense during the Kennedy/Johnson era. 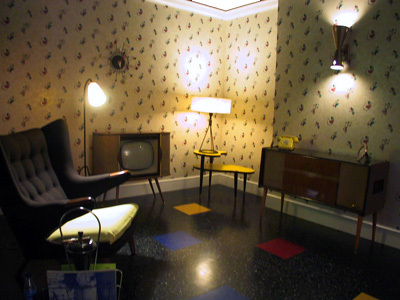 Not a genre that one would expect to find a Designer credited, but Errol likes to re-create certain environments for visual storytelling, which intercut to underline the sub-text, and illustrate some of Mcnamara's lessons. 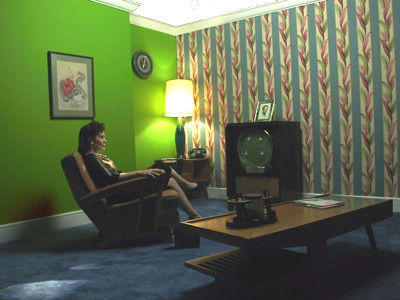 While the film is mainly interview footage of McNamara and a wealth of archival footage, there are many set pieces that were done in the studio, some of which never made the final cut of the film. Template sketch for all period sets. 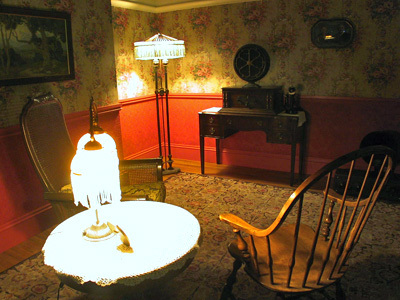 The room corner was recreated in various period styles each having a radio and/or television of the period. 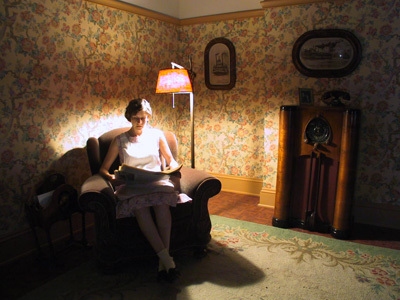 The rooms were to be cut into the film at appropriate moments where that period had audio/visual material. Each room was stylized to be typical of the period. Unfortunately none of these made the final cut. The sequence of dominoes falling across S.E. Asia was originally worked out on paper and in 3D on a computer. I did this to determine the best sizes for the dominoes and maps. The map was a period map, reproduced as a digital enlargement in scale to a regular sized domino. For the last falling dominoes over Hanoi, we cut to an oversized domino and an enlarged section of the map keeping the scale consistent with the smaller dominoes and map. The oversized domino allows for more dramatic up angles, shot with the revolution lens system, slow-mo with dust. Sketchup using MSPhysics rendered with Thea Render. A small set to house the telex machines that were receiving the communications from Russia during the "Cuban missile crisis". These working telex machines, and the original punch card machine in the film were generously made available to us through the Computer museum in San Diego.